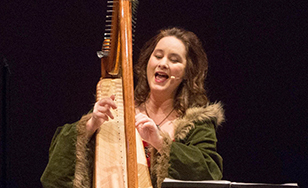 St. Scholastica will host singer Katie McMahon's "Celtic Christmas" performance at 7:30 p.m. Friday, Dec. 8 in the Mitchell Auditorium on campus. Back by popular demand, McMahon will celebrate the season with performances of favorite Christmas carols backed by her band. The show will also feature lively high-stepping Irish dancers. McMahon first gained fame in the 1990s as "the voice of Riverdance," a theatrical show consisting mainly of traditional Irish music and dance. She was a vocal soloist of the stage production. A native of Dublin, Ireland, she was classically trained in voice and harp. She now resides with her family in Minneapolis. Tickets are $20 for adults, $15 for seniors and students, $10 for children. For more information, visit spotlight.css.edu or call 218-723-7000.